Latest medical research shows: immune cells produced naturally in the body can conquer cancer. Now a newly found blood and immune therapy gives “super strength” to the body’s defense. A real qualitative progress in the treatment is urgently needed and not only small improvements, for the number of cancer victims is still increasing according to the information of the World Health Organization “WHO”. Only in the year 2008 there were over seven million deaths worldwide and in Europe 1.7 million cancer victims. Also in Germany the numbers are more horrifying than generally believed: Thus daily 50 women die of breast cancer despite of all improvements in the conventional treatment and better survival chances than 10 years ago. Yearly 17.000 women die. The situation of men is similar where daily 30 men and yearly over 11.000 men resp. die of prostate tumors only. In all, approximately 200.000 Germans die of cancer every year. One of the central problems of conventional cancer therapy is: chemo- and radiation therapy can cause severe side effects such as weakening of the body’s own defense, fever, nerve disturbances and anemia. On top of that the killing of cancer cells is not always permanent and the disease can spread and start anew after a certain time. In this context it is unbelievable that alternative methods to strengthen the immune system find so little attention and application. That applies to phytomedicine and other naturopathic treatments as well as highly modern methods such as the newly found NK-cell-programming. Mathias Schobel of the Baden-Baden special laboratory “Cytomed” with specialized practice for treatment declares what is hidden behind the new method of “immunological oncology through adaptive immune transfer”, scientists found out that the so called NK-defense cells and the “gamma-delta T-cells” (a subgroup of defense cells in the human blood) respectively can be effectively increased specifically. And precisely these cells are able to protect the organism against bacteria and abnormal cells such as cancer cells. On top of that they possess a “memory” that can immediately be activated in later years if abnormal cells should appear again. With the help of special “programming” these cells can be directed specifically against tumors but also activated against allergies and rheumatism thus strengthening the body’s own immune defenses. This “programming” is relatively easy as Schobel declares, “thereby you take blood from the patient and out of this blood immune cells are isolated. A special mixture of medications which activates the corresponding defense cells is added and the blood given back to the patient.” This way one’s own blood is quasi supplied with “super strength”. Also with this kind of immune therapy it is also important when the beginning of cancer is detected to start strengthening one’s own defense system as early as possible. And if a surgery, chemo- or radiation therapy is applied, the strengthening of the immune system should be done before and after treatment to rebuild the immune system and to prevent relapses. Equally important is the early diagnosis of possible dangers. There are also well proven methods in alternative medicine for this which are able to recognize cancer in the early stage even years before its real outbreak. 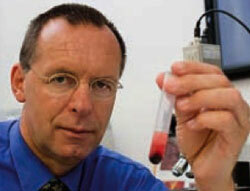 For this the specialized laboratory Cytomed applies among others methods of blood analyses under the microscope such as for example the HLB test (Bradford-test which is a recognized method in allopathy in the USA) and the optical erythrocytes test (OET) according to Prof. Arno Linke M.D. When applying the HLB test one can find out through the way blood proteins are stored and build a net how strongly the body is affected by free radicals which corresponds to the severity of the disease. Research from Dr. Bradford has shown that all chronic and degenerative diseases correspond to certain free radicals. This way a diagnosis and the choice of appropriate remedies are possible. Radicals can be neutralized by various naturopathic remedies such as enzymes, vitamins or other antioxidants. In the optical erythrocytes test red erythrocytes are examined if they contain deposits of foreign or false proteins. Amongst them there are certain antibodies typical for cancer. Normally these contaminations are cleared by the usual “surface cleansing” of the spleen. In case of cancer it does not apply. Under the microscope these appear as dark, rod-shaped accretion. The analysis of them serves the early detection of cancer and the evaluation of chronic inflammations. “If these and other methods of analyses are combined, a real early detection of cancer and other severe diseases is possible,” Schobel declares. Together with the newly found strengthening of the immune system by the NK-cell-programming a highly effective alternative cancer prevention and therapy is possible according to the latest medical state of knowledge.